Gmail has got new layout, there is now a preview pane option in Labs. 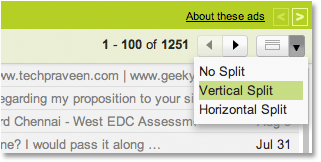 With this cool new feature included in Gmail users can now get two-pane view which displays the email list as well as the currently selected message in either horizontal(New Yahoo mail like) or vertical split(iPad-like) view. 2. Goto Gmail Setting –> Click Labs section. 6. That’s it 🙂 .The currently selected message will be displayed in full to the right or below the email list.